Description: Grand stature and an ornate hand-forged metalwork create a rich, luxurious look for Caprice. This high-styled wall fixture features Beige Flemish Glass, which is enhanced with a scroll design and decorative accents featured in a Wrought Iron finish. 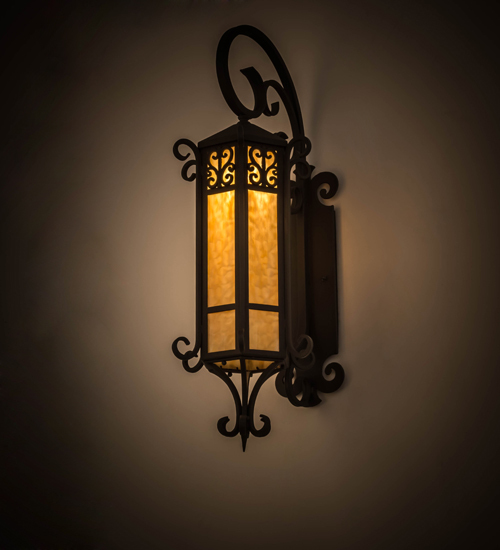 This classic sconce is ideal to complement a variety of architectural styles for today's exteriors and interiors. Custom crafted in the USA, this fixture is offered in custom sizes, finishes, and styles, as well as energy efficient lamping options such as LED. The wall sconce is UL and cUL listed for dry and wet locations.